Back surgery alternatives should always be considered first. Back surgery alternatives highlight the high incidence of FBS as medicine calls it, suggesting conservative care should always be first contemplated. May I be totally honest? All of us in the back care business are trying to make a living, and there's little altruism in spinal treatment. We're after your dollar, and we're convinced we can do it better than the next guy. The chiropractor can't wait to manipulate you, and perhaps not give you some exercises so it won't start again next week. The acupuncturist is desperate to get his needles into you. The surgeon wants you under his knife, and perhaps the most dangerous of all, the drug companies want to get you taking anti inflammatory medication. And we all think we have the best solution and the most value for money. What does the research say? What are the back surgery costs? After the examination and history, a chiropractor has to weigh whether there are any ominous lumbar signs; it may be useful to know what they are. In difficult cases, good cooperation between the doctor and patient is vital. You can have the best chiropractor in the whole world, but if you go playing silly buggers then you will certainly end up under the knife. And, of course, if you don't cooperate with the surgeon, then there'll be a second operation, followed by a third. The presence of these ominous signs, means that you simply have to stop; quit sitting, no bending and faithfully doing the prescribed lower back exercises. The length of time you will have to discuss with your chiropractor; he or she will spell it out for you. A patient I am right now treating has one of these ominous signs; he has an extrusion of disc material into the intervertebral pain, with minimal back pain, but severe leg pain; his leg is both lame and numb. Today he has 50 percent less pain, and is thigh muscle is no longer giving on the stairs; that's very satisfactory after only 10 days of treatment. Eid is starting and he wants to know if he go and slaughter an ox to give to the poor. No, he certainly can't! To be honest there's a place for chiropractic and surgery and acupunture and antiinflammatories under the sun. Increased leg pain after surgery, and after chiropractic manipulation are both a possibility. Each have their merits and de-merits, and it's up to you and the professionals you trust to weigh them. Should the lady above have still trusted the surgeon? Obviously you should read this page with some sceptism, it contains a good deal of bias. Whilst chiropractor's patients don't die on them, some certainly get worse after manipulation. After having been in the low back pain business for thirty plus years, I am 100 percent pro Go-to-a-Chiropractor FIRST. It's not just my opinion, independent research confirms that if you FIRST consult a chiropractor you are less likely to end up under the knife. Does that mean that I never refer patients for surgery. Absolutely not. After a reasonable try of chiropractic care, if the condition is progressing, a second opinion is always a must. I'm for good surgery, but I still think it should be the last option. Rather the back surgery alternatives. Why? There are many reasons, one is the development of leg pain after surgery. Dual antiinflammatory drugs ... most dangerous of all. A friend had her sixth major lower back surgery, with five hours in theatre with the same surgeon who had done the five previous operations. She was in severe pain, in her abdoman and back, before the surgery and after the procedure she was still in great pain. So, back into theatre, which she told me she dreaded because the care in intensive care was so shoddy. They found a bleeding ulcer from all the NSAIDs she had been prescribed. Still in great pain, so the team of surgeons opened her up a third time; that pain was coming from an infection in the wound in her back. She had weakened considerably by Saturday, with her son sitting with her all day till nightfall, when he left her to return to his wife and son. She died 10 minutes later on life giving apparatus. Her daughter flew in just 10 minutes too late - so sad. It was a glorious funeral service (memorial) in the church-presby. About 150 people, many of our congregation were there. It was skyped through to her eldest daughter in North America. When you bend forwards most of the flexion initially occurs in the hip joints and not in the back. Thereafter, progressively the lumbar spine joints (five of them) begin to bend. If flexion at the hips, or one of the lumbar joints is very limited, then the other joints have to take up the slack, placing increasing strain on those joints. Almost invariably when then there is a radical discectomy at one level, it's nearest neighbour crumbles too. 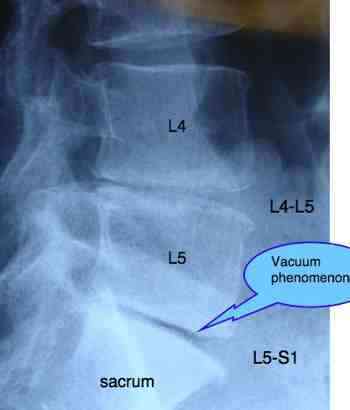 Notice the air in the joint (it looks black), the so-called vacuum phenomenon associated with a collapsed joint. 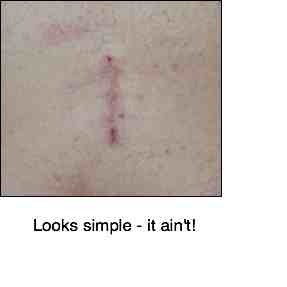 Is there a back surgery alternative today? Lower back and leg pain exists in epidemic proportions in today's sedentary society; the lumbar spine doesn't like the chair. This is the Xray of a 63 year old woman. It was taken lying down so you can't detect the short leg. Thirty years ago, she told me, she didn't have back surgery alternatives when she had a slipped disc with severe lower back and leg pain. The details obviously after all this time are a bit sketchy, but she recalls being stuck in an antalgic position for two months. She hadn't heard of chiropractic, and no one suggested it. She underwent a radical discectomy at the level L5 S1 in the Netherlands; there were in any case very few chiropractors at that time. The surgery was reasonably successful; the pain in her leg was relieved within a few days, and she could stand up straight, but the pain in her back, mild it's true, never went away. Sitting has remained a problem ever since the operation. Progressively over the years the stiffness in her back increased; now we can see why, because the L4 L5 joint was disintegrating; the level above the surgery. Three years ago it started to become unbearable with pain radiating on and off down the side of her leg from the L4 L5 level. Sitting for any length of time became intolerable. Interestingly she obtained relief by crossing her legs, but overall she was miserable. Despite various medical and physiotherapy treatments she had little relief from the pain. Treatment by a manipulative therapist brought a measure of relief. She recalls falling down the stairs, hard on her sacrum, in her home a few years before the surgery. Would this history have been any different had she chose chiropractic thirty years ago? Of course we have no idea. But we believe in chiropractic that rehabilitation of that L5 S1 joint would have been a better option than radical surgery. We treat patients every week who are stuck in an antalgic posture; ever seen someone looking like the Leaning Tower of Pisa? Chiropractic help always before surgery; controversially I'm also for massaging bed rest. When you look like the leaning tower of Pisa you simply can't stand, and you shouldn't sit. So, what's the alternative? Bed rest with exercises, and getting up every hour for a short walk. It's all part of our slipped disc rules. None of the back surgery alternatives will help if you refuse to follow your doctor's instructions, be he chiropractor or surgeon. Had chiropractic not succeeded in relieving the pain in her leg, she could still have gone for surgery. That would have saved the L4 L5 joint from the severe degeneration that she now has. Perhaps, you are probably saying; indeed. Research following patients over a twenty to thirty year period is now called for to compare the overall benefits of one form of treatment over another. Perhaps the chiropractic and back surgery alternatives are not better. At least it's an option you may want to consider if you wish to avoid going under the knife, as we say in Holland. On examination, a short left leg was immediately obvious; she wore a heel lift prescribed by a podiatrist which enabled her to walk without pain, otherwise ambling and standing were difficult. Ranges of motion were remarkably good, and tests for an injured or irritated nerve were negative. Motion revealed fixations in the left sacroiliac joint and at L4 and L5. 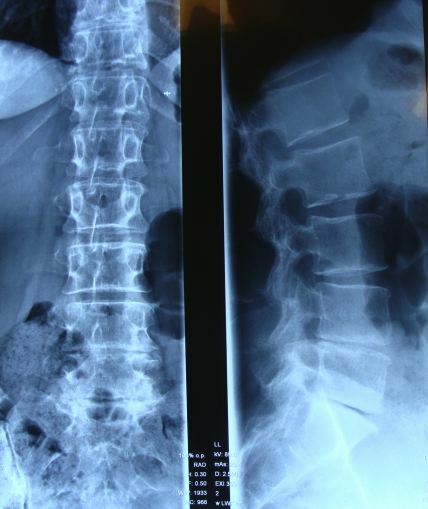 Lateral bending provoked pain in the back, and some sacroiliac joint tests were positive. The overall conclusion was mechanical lower lumbar and sacroiliac joint pain with no significant nerve root involvement. We'll see how she progresses. A vigorous exercise programme will be essential. Actually I love these chronic, non nerve pain patients. They usually respond well to gentle chiropractic treatment, but there won't be any miracles. Patience and time will be required. Update: Mrs K is doing more or less as expected. About fifty percent better. I'm afraid she's a patient for life, just like a diabetic or heart patient. No one can cure her. She's doing these exercises faithfully. Perhaps you have had a bad experience with chiropractic, or are afraid of manipulation. Not everyone responds magically to what we do, and yes I admit to some patients who have increased pain, though it's usually of a temporary nature. Mostly those who don't respond well get neither better nor worse. They just don't respond no matter how hard we try. Backs are difficult! I probably don't need to tell you that if you are reading this page. So what then are the chiropractic and back surgery alternatives? I'm a great believer in exercises for the back. Find someone with experience in your area who will take you slowly and gently through a set of exercises, gradually becoming more difficult. Don't be in a hurry, just do them regularly every day, particularly first thing in the morning on your bed. Avoiding deep luxurious chairs, and the car. Less sitting alone often helps somewhat. Rather perch on something high with your legs dangling, or lie on your back with the hips and knees slightly flexed when watching TV. Provided he wears it and does his exercises, he copes with his back (without regular chiropractic). I foolishly didn't press hard enough on a weight issue. At 95 kg he was definitely too heavy. He's just had a triple bypass... scary at 52. Acupuncture has been shown to be successful with low back pain, more effective than antiinflammatory drugs. Just a good massage once a week would help, note well, lying on your side. Instead of bending, when picking something off the floor, go down on one knee. Avoid going down on your haunches. One knee. Slipped disc rules should always be adhered to when suffering from severe back and possibly leg pain; refusal to slow down and perhaps stop for a period means you are likely to be considering back surgery alternatives, and if that fails, then the knife. These home rules are vital for the patient with severe low back pain and leg pain who is wanting to avoid back surgery. What you do, or don't do that you should, will have a profound impact on the success or otherwise of your chiropractic treatment. Sometimes, when the lower back and leg pain just doesn't respond to ANYTHING, or you develop a foot drop, and that too doesn't respond to Chiropractic Help, then you really have no option but to consider surgery; the search for back surgery alternatives is over. This is especially true if you have severe leg pain and little in the lower back. As the soft cushion, the disc, degenerates the vertebra above settle on the bone below. The net result is increased pressure on the hyaline cartilage that covers each bone in a joint. Hyaline cartilage doesn't like pressure. Same as the pressure in the knee in obese persons. The result is progressive arthritis. Enter omega-3 fatty acids. Overwhelming research confirms that three fatty acids in foods such as fatty fish, flaxseeds, avocado, walnuts and pecan nuts will aid in the healing, and prevention of progressive arthritic degeneration. I personally try to consume at least three of these four every day. Over and above the exercise and my own occasional maintenance chiropractic treatment. I too have worked my back hard. Lifting bees hives, moving gliders, building compost piles is physically demanding. Ultimately, the lower back's biggest enemy however is the chair and not hard work.